The SMOK ProColor 225W TC Starter Kit is the latest masterpiece from SMOKTech's advanced systems, delivering a visually striking ProCore 225W Mod with customizable 12-Color LED backlight and new full-color OLED to pair with the dynamic TFV8 Big Baby Tank. 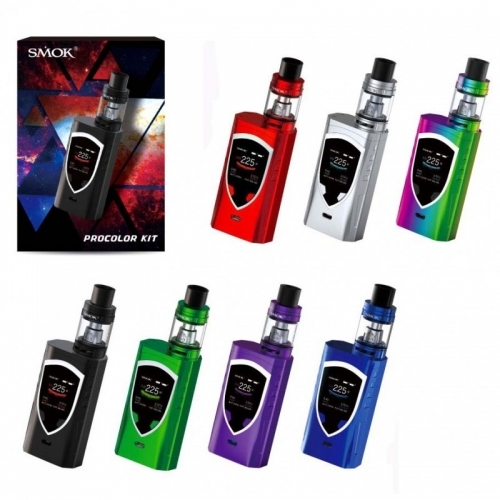 The ProColor 225 implements the most advanced technology and innovative designs SMOK has ever produced, presenting a soft contour chassis with a shield trim at the center of the device and anti-slip squeeze-to-fire lateral bar for an embellished yet ergonomic structure. The main features are integrated into the control face section, presenting an updated user-interface for the 1.3 Inch OLED screen with customizable color change as well as more intuitive operational setting compare to the previous generation of SMOK's incredible output devices. Furthermore, the shield trim has similar technology to the T-PRIV, with adjustable 12-color LED backlight for a spectrum of vibrant colors and control settings. Internally, the ProColor 225W integrates a powerful 225W chipset with comprehensive temperature control suite and preset Memory Modes. The included TFV8 Big Baby Beast is the premier compact sub-ohm tank in its segment, offering a well-balanced dynamic range with 5mL juice reservoir, precision airflow control, signature hinged top-fill system, and the popular Baby Turbo Engines coil structure. Despite the shorter stature and diminutive in size, the TFV8 Big Baby Sub-Ohm Tank is a compact rendition of cloud-chasing achievement, based on the high performance V8 line. The perfect statement piece with class-leading functionalities and advanced technology to exhibit SMOKTech's engineering prowess, the SMOK ProCore 225W TC Starter Kit is set to be the next achievement of the industry.